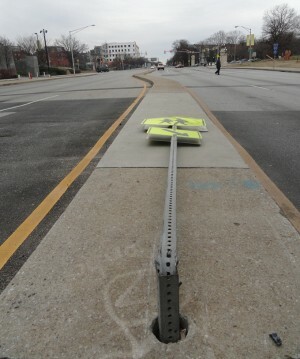 In Baltimore, there are good crosswalks out there, but there are more that are mediocre. Many have the stripes worn away. Others are not prominent enough to slow oncoming drivers. The sad state of crosswalks often includes areas that garner walkscore.com ‘s prestigious “walkers paradise” rating. Next time you are on a walk, notice the street crossings. Are they prominent? Are they in good condition? Do they slow car traffic? In health circles, advocates preach that walking is good for your health. That is not true if you get mowed over by a car, truck, or SUV. Walking can be deadly. In 2009, 4092 pedestrians were killed and 59,000 injured in the US according to walkinginfo.org According to the New York Daily News, “about 19% of the 770 pedestrian fatalities from 2005 to 2009 (in New York)- roughly 150 deaths-were people crossing at an intersection with the walk signal in their favor.” Over the five year period, 335 deaths occurred at intersections controlled by traffic signals. This means crosswalks are not doing a good enough job, and there is room for innovation and upgrades. In the 2010 Pedestrian Traffic Fatalities by State, prepared for the Governors Highway Safety Association, the study makes no meaningful analysis regarding the quality or type of crosswalks in pedestrian safety, nor does it dive into vehicle speeds or road design in areas where pedestrians frequent. It does offer impotent conclusions like “pedestrian fatalities are affected by the amount of walking” and “no single countermeasure can make a substantial impact.” Pedestrian infrastructure deserves an out of the cubicle analysis. Jeff Speck, author of Walkable City, argues walkability is the single factor to attracting and retaining business and entrepreneurial talent. Surely, playing frogger from one side of the street to the other is not part of the recipe for Speck’s walkable prosperity. Kaid Benfield has a persuasive post about poor walking conditions across America where he points out, that in 1973, sixty percent of American kids walked to school and by 2006, kids walking to school had dropped to 13 percent. Should walking to school in America be an unusual thing? I don’t think so. I write this post, because crosswalk (and street) design does not consume enough of the discussion about safety, walking for health, or economic revitalization. It should. Pedestrian planners are often not the ones with the big influence at DOTs or MPOs and their influence is not heard enough. A notable exception may now be Los Angeles. LA Mayor Antonio Villaraigosa is championing the investment of 53 “Continental Crosswalks” starting implementation near transit lines and schools. These crosswalks will have a vehicle stop line, have wider stripes, and be more prominent than LA’s other 5250 crossings. LA has recognized the challenge and is beginning to overhaul its pedestrian infrastructure. If your town, suburb, or city needs better crosswalks, let people know. It may save someone’s life. I’ll conclude with a slideshow of good and not so good crosswalks. It’s very simple. You cross when there are NO cars. Get it people. Look both ways, make sure no cars are coming, then it’s your turn to cross. Otherwise, suffer the consequences.